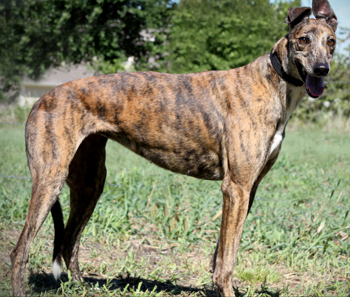 Sweetie, aka Prima Sweet Day, is an 8-year-old brindle female, born July 16, 2003. Her sire is Kiowa Sweet Trey, and her dam is Prima Day Dream. Sweetie has 75 races to her credit on Greyhound-Data.com, starting April 9, 2005, at Lincoln Park in Rhode Island, and finishing at that track on April 6, 2007. From there she went on to be a brood, having her first litter of four registered pups on April 3, 2008, sired by the late famous Dodgem By Design. Her second litter of two registered pups was on May 26, 2009, sired by Kiowa Mon Manny. 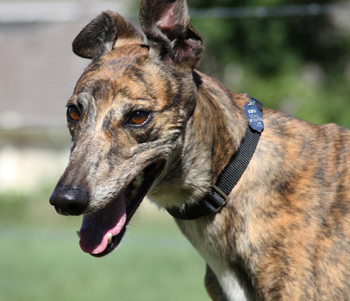 Sweetie arrived with 3 other greyhounds - Arrow, Hunter and Captain - on September 21, 2010, from a coyote hunter in Amarillo. Sweetie is happy, happy, happy all the time! Her tail never stops wagging! She is personable and very friendly. Sweetie was in a home for three months, but has since returned to GALT through no fault of her own. Sweetie is not cat tolerant, and has yet to be tested with small animals. Everytime I look at Sweetie I can't help but smile or laugh. She is just so darned cute! She has a trademark sitting style not common to most greyhounds - best described as a reverse frog-dog. She's so limber you'd never guess she was 8! She has adorable ears and a cute little snaggletooth - a result of having most of her teeth removed. But don't worry about her eating habits. She does just fine with wet kibble. Sweetie crates well when nobody is home and she sleeps thru the night, usually roaching against the wall. She spends a lot of her day alternating between sleeping and sporadically playing with squeeky toys. Walks might just be her favorite thing ever - she can walk for 30 minutes and sometimes more when the weather is cooler. She's very good on walks and doesn't pull, unless she thinks she can get a squirrel. She has a mild prey drive, depending on the animal. She will frequently pass by pigeons a foot away from her and not even notice them. She loves people and attention, and wags her tail frequently. Sweetie is good at project management as she will usually supervise dinner making or outdoor chores such as working in the yard. She also tries to update her facebook page often and stay in touch with all her frenz.